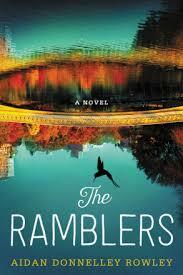 a book chick: "The Ramblers"
So! Grabbed it before bed on a particularly insomniac-al night and read till 2 ... and because I was so tired the next day I finished it instead of cleaning the garage. Hard to say if it's THAT good or I was in a particularly needy state. Three main characters - Clio and Smith, roommates at Yale, and Tate, a classmate - each get their own sections, each beginning with a document of some sort about them - college entry exam, intake form for life coaching, application for graduate school, etc. The action of the plot takes place over the course of Thanksgiving week, with throwbacks to the life traumas that each of them is attempting to overcome. Set in modern day New York City, in particular the Rambles of Central Park. my source: I. really. can. not. remember.